This past summer, my wife thought she "killed the clutch" (her words) coming back home. Fortunately, she was wrong, but she has done that before (in our Neon at Byron dragway some years back). This time, though, she was literally right down the road from the house, so fortunately, our son was able to hop on Project Frogger, our Polaris Ranger UTV, and tow the car the rest of the way home. Who says that HD tow loop would never come in handy? Ha! When I got in the car and felt the shifter all floppy like it wasn't connected to anything at the transmission, my first thought was a shifter bushing under the shifter or at the trans might have disintegrated. Turns out I was kinda right. It was what FCA calls a "tension strut." This little dog-bone shaped thing connects two parts of the shifting linkage right at the top of the Dart's manual transmission. When the very poorly designed bushing goes bad, shifter feel gets sloppy, and then the ring portion will eventually just hop right off the ball joint on that end (pot hole, bump in the road...) and then you're done putting the car into any gear. Looking around with our distributor and with other retailers, I found nothing but the OE tension strut. I wasn't going to just throw good money at bad parts, so I set out to design a better solution. Since the ball at each end of the tension strut is a standard 10mm ball (like what you'd clip a trunk or hood spring onto) I set out to make a very snug-fit bushing that had that ball shape inside it. The result is our p/n PF1MTSLNKP. This replacement bushing is 75A durometer, same as our "firm" solid-filled poly mounts. 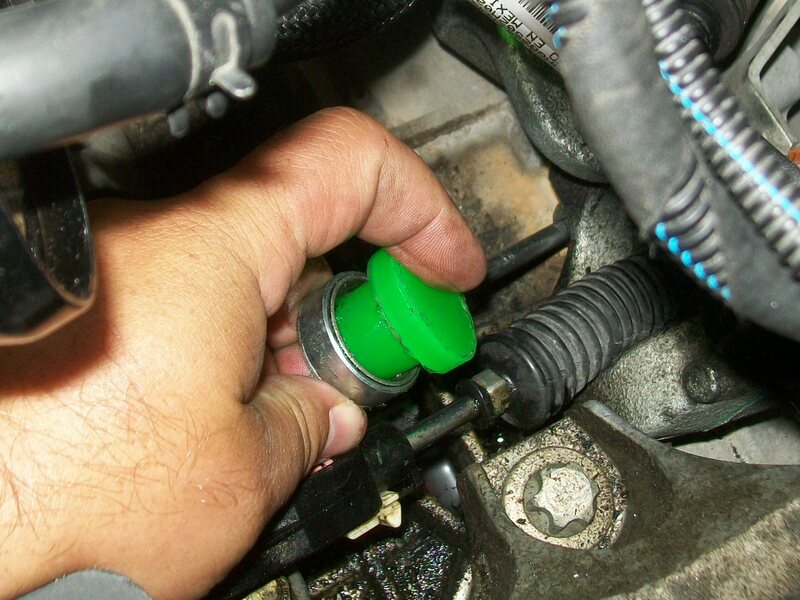 To install it, you just clean the remaining rubber out from inside the (large) bushing end of the tension strut, press in our bushing, and pop it back on. For the 1.4 turbo, removing or at least loosening the IC piping makes it a little easier to get your hands in there. 2.0 / 2.4 is even easier. I was pretty happy with that, but wanted to design a complete replacement for those wanting more durability and security, especially in racing. For the second solution, we have a complete replacement. It uses 316-SS 6mm threaded rod, jam nuts to keep the end links in place, and stainless steel end links with special lock pins. Just for the coolness factor (and because we stock the hose for other uses) we top off the center section with silicone hose to protect the threaded center section. No bushing to go bad or generate any play whatsoever, and a complete replacement, but it's more expensive and tedious to install, because those locking pins are like sewing a button on a shirt in the dark. Well, not that bad, but it's not as easy as just popping a bushing in. Combined with our CDV Delete and rear engine mount, this item can really have you getting through the gears FAST! Last edited by DeyemeRacing; 10-09-2017 at 07:29 PM. is What to do next? 2015 Dodge Dart Aero 1.4L Turbo w/ 6-speed Manual Trans. So which one of these would you think are the best option to go with? From what I just read, im thinking even though there is a little more work involved, the complete replacement would be the best choice. That's tough to say. I'll start with the solid SS one. I've been using those stainless steel ball end links on trunk and hood props for years. Before using them on our 124 Spider hood and trunk spring kits, I used them on our boat to replace the cheap nylon spring ends. They're also in use on our '09 Challenger. On one hand, the same part in use on a shifter is going to go through more movement cycles than on a trunk spring. On the other hand, it's not holding a lot of spring tension or weight like on a trunk spring... see what I'm getting at? So the real question is, what's the life cycle in this particular application? I'm thinking way, way beyond the life of the transmission, or the whole car for that matter. But it would be a good idea, and I'll add a note in the instructions that go out with it, to grease the links upon installation and once every 3/36 (3 years or 36,000 miles). Once installed, you can probably just firmly rub grease around the link at the ball, rotate it a bit to spread the grease, and wipe of excess. So... that's the best option, but I haven't had this item in use in this way for a long time to examine it for wear. We'll pull ours off after 1 year and I'll put it under a microscope. Yes, really. Now, the bushing. If the rod is otherwise perfectly good, why spend $69 on a whole link, when a $9 bushing will do the job? Did FCA put a bushing there because they were concerned about vibration doing something bad to other components? If so, why do some Darts have tension struts that are small on both ends and don't have abushing? And why is the only available part now, the one WITH the bushing, when it's known to fail so... reliably? When I developed the bushing solution, this wasn't new territory. I've made shifter, sway bar, and other bushings before, and have been making our engine mounts for over 20 years. The formula we use is unique to us (secret recipe like KFC, yo) and has a very good track record. I also didn't yet know that some of the tension struts floating around out there didn't have a bushing. Learned that when we sent out free prototypes to a few customers to try out. The bushing is sized PERFECTLY for a very snug fit inside the o-ring, and the shape inside is a 10mm ball, so it really is made to fit just right on the mount. No need for e-clips or other devices to keep it from falling off. This bushing is the first piece with such a complex shape where we actually had to embed steel (the 10mm ball portion) into the mold, because when the ball shape was part of the mold, it just kept shearing off into the newly formed part! That was a new engineering challenge, but but I think the result is worth the trouble. To say the bushing fits like a glove is an understatement. Since it is still a polyurethane bushing, though, and not solid metal, it will absorb a small amount of ever-present vibration, which means it'll outlast the rest of the car. And for just ten bucks, you can't really go wrong. So, long story short - I don't know. I was happy with the bushing, but switched to the solid SS one because I wanted to develop something for race use, and for those who discovered their tension strut was bent, or just didn't want to hassle with trying to press a bushing into the old OEM piece. 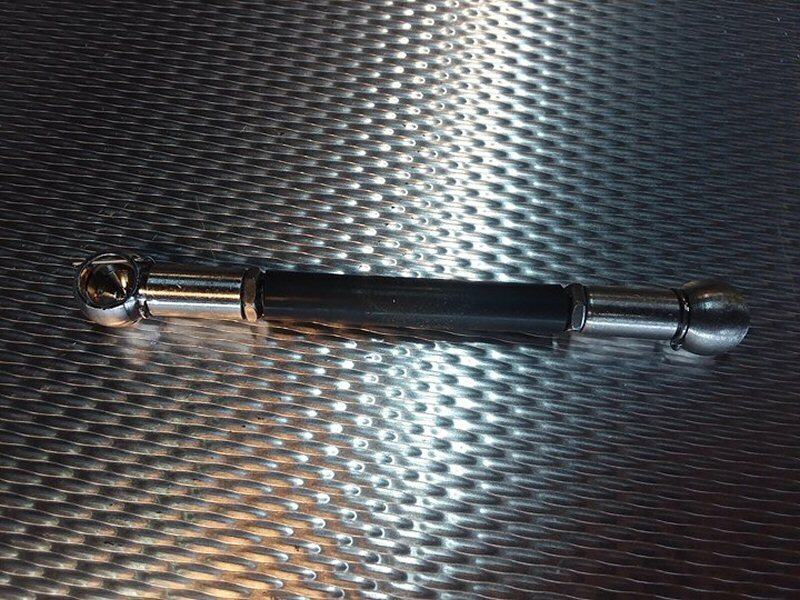 2016 Dart GT MTX shifter rattle? ?